It was a year for the record books. In 2017, the U.S. stock market set a record with the most closing highs in a single calendar year, ending the fourth quarter with six full weeks of gains for the first time since 1954. The S&P 500, including dividends, increased for 14 months in a row, which was the longest consecutive run since 1928. Volatility, a measure of stock movement, remained at historic lows. 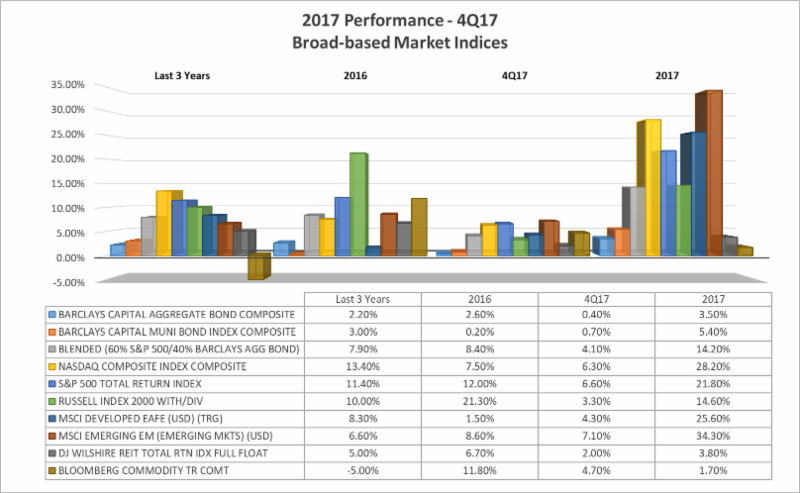 These records were contrary to many analysts’ forecasts for 2017, which called for low to moderate gains. Instead, the S&P 500 posted its best yearly gain since 2013, rising 21.80%. 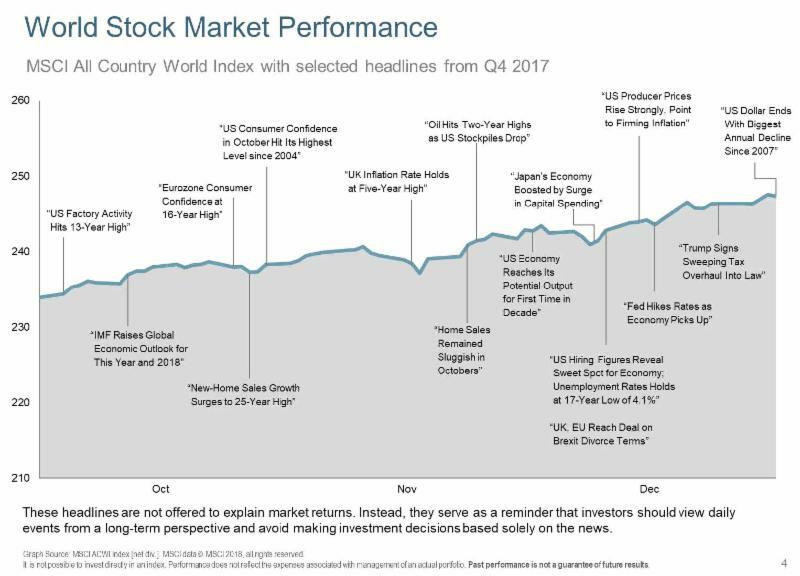 In addition to low expectations, several driving forces influenced this record breaking year including the rise in domestic corporate earnings (11% in ’17), concurrent growth amongst global economies, and relatively low global interest rates and inflation. International markets finished at or near records highs, and emerging markets rose a whopping 34.30%. Economists described the year as being long overdue, with synchronous global growth and renewed optimism taking hold after years of false starts following the financial crisis. Information technology was the leading sector gaining 36.9% for the year, with the five largest U.S. companies by market value: Apple Inc, Alphabet Inc, Amazon.com Inc, Facebook Inc and Microsoft Corp contributing a larger proportion of the sector’s rise. The fixed income markets defied projections as well. Most analysts forecasted a rapid rise in 2017 interest rates in anticipation of the Federal Reserve’s 3 of 4 projected increases, and the reversal of liquidity programs put in place between 2008-2011. Instead, the yield on the benchmark 10-year Treasury note, often seen as a gauge of investors’ sentiment about the economy, closed slightly below 2016’s 2.409%. Even more surprising was the gap between short and long-term interest rates, which continued to decline. In the past, this condition has caused concern as it is a reliable indicator of pending recession. In five of the past six times the 2-year Treasury yield exceeded the 10-year yield, the economy successively contracted. However, this time, experts point to other reasons such as easy money policies in Europe and Japan which have pushed yield-seeking investors into U.S. debt, sending yields lower. Alternative income assets including commodities, global infrastructure, and real assets also advanced with the revival in global growth, however to a lesser degree. As mentioned earlier, inflation, although rising, remained stubbornly below the Fed’s targeted level of 2%. These assets typically trend higher in an inflationary environment, and provide diversification within a stock and bond portfolio. Their contributions could be forthcoming. Looking forward to 2018, it’s obvious that the chance of a repeat of the stock market’s 2017 record year is relatively low. Fidelity’s Jurrien Timmer has noted that earnings growth has begun to moderate back to its long-term growth rate of 7%, and although positive, is less than we saw last year. Tax cuts may add some additional growth; however, it may be fairly reflected in stock valuations with the price earnings ratio at 21.5 times trailing earnings. The Fed has projected another 3-4 increases in ’18 and continued maturity of its balance sheet (decreasing liquidity). Foreign central banks are also beginning to talk of curtailing liquidity in their respective economies. Markets continue to reflect a low risk that interest rates will increase enough to ignite a recession in the near future. However, experts’ concerns include surprise inflation with overreaction by central bankers, a euphoric stock market with investors chasing returns without actual earnings results, potential ripple effects from a slowdown in China, or geopolitical events such as trade disputes or military threats. Even if these concerns are not accurate, there is a growing probability and consensus that volatility will return to the markets even within the context of an expanding global market. As 2018 unfolds, we will continue to monitor how the markets and developments may impact your financial plans. We look forward to discussing your goals as we head into this new year!